We hope to CREATE a high quality CLUB PHOTO BOOK for display at the Exhibition (Wed 24 April to Sat 15 June 2019). Those that would like their images to be included in the photo book need to email through a high-resolution image (open theme) which best shows their improved photography as a result of club activity, whether at a meeting, on a field trip or posting to our Facebook Group page. Email one image to viewfinders-ttl@gmx.co.uk please. The size of the book will be very much dependent on the responses to this appeal. 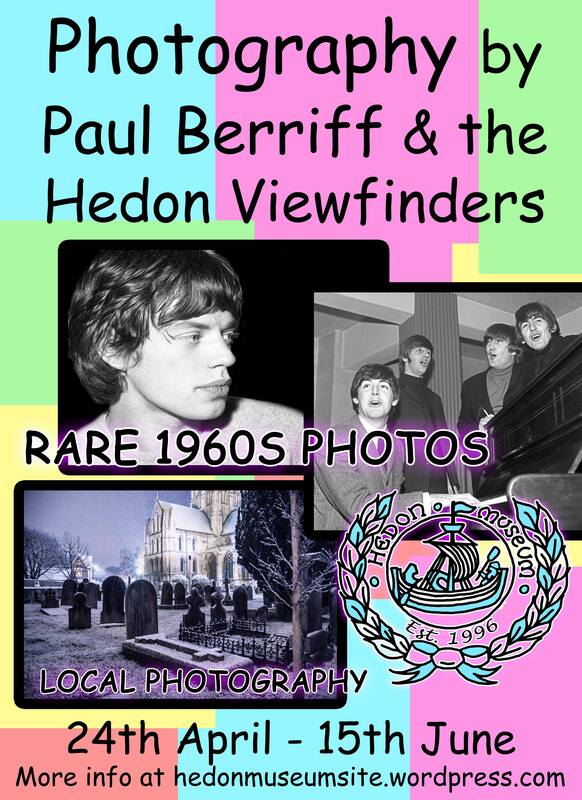 The Exhibition featuring ‘typical’ club photographs from members on the theme of “Hedon” takes place downstairs at the Hedon Museum (accessed via a snicket on Watmough’s Arcade, Hedon) every Wednesday and Saturday from Wednesday 24th April until Saturday 15th June, 10am – 1pm each day. Meanwhile, upstairs at the museum, an exhibition of iconic 1960’s photographs taken by Paul Berriff is on display. Reminder about the Evening with Paul Berriff on Wednesday night 17 April. JUST a reminder that the deadline for submission of original prints for the Exhibition on the “Hedon” theme is our next meeting on Wednesday, 3 April 2019 at the Haven Arms. Please make sure you place your prints in a protective cover to keep them clean during selection. More information at: Exhibition (Guidance). The April 3 meeting will also serve as one of our network meetings with an opportunity to catch up with other members and informally chat about club activities and plans. We’ll have some of our magazines, books and equipment available for members to loan. Ticket sales for the Paul Berriff meeting on Wednesday 17 April are going very well. It is possible that we will be ‘full’ unless you’ve booked or purchased your tickets in advance. There is still time to book on the 4-day Torquay club trip on Friday 7 June 2019. Contact us for more information. Free, fun and friendly photographic club. Open to all. No membership required. A POSITIVE and productive meeting was held at the last Club meeting on Wed 6th March to look at improving what services we provide for members and to encourage more involvement. A POSITIVE and productive meeting was held at the last Club meeting on Wed 6th March 2019 to look at improving what services we provide for members and to encourage more involvement. Glenn Stallard has an interest in training, and with that in mind will be helping the club to devise its programme of meetings, speakers and practical photography sessions. Martin Pinder will be helping the club in the management of its exhibitions. Jo Stallard will continue to arrange some of the club trips, particularly the photography holidays, in addition she will be playing a role in helping to encourage fundraising for specific things. Jo has also agreed to keep the notes of key decisions made by Hedon Viewfinders. Jo has produced the notes that follow. Whilst people have kindly agreed to take on roles more formally, we encourage members to continue to offer their support where and when they can to generally lighten-the-load of those carrying out activities on behalf of the club. These finances are shown on FB (Facebook) but before putting on web page settings need looking into so this can’t be seen by all. Suggested by Carl. Suggested further fundraising to be undertaken for hearing loop for the club. Paul Berriff 17th April. (A member) made the kind offer of paying balance owing on this meeting should it not be covered fully by ticket sales. Costing for speakers discussed & arranged at meetings. A number of people would like poster advertisements that they can put up in various venues. Date was discussed 24th April to 15th June. 20 images can be shown. Images for submission should be received by 3rd April. Brochure to be given out with museum submissions & also other images. More pics in brochures for people displaying in museum. Tuesday 9th April suggested as an extra meeting to sort mounting prints for exhibition (using club funds). Exhibition manned by members & raffle tickets can be sold. A further exhibition may also be held this year (possibly at Haven Arms). This one will be less restrictive on type of photographs and with more pictures displayed. Glenn Stallard volunteered to help Ray with booking of speakers & plan in advance for winter sessions. Martin Pinder volunteered to help with the running of exhibitions. Joanne Stallard to take notes at meetings when required & write up official records of decisions made. The number of photographs posted on a daily basis on FB has been lowered from 7 to 5, with this raising to 10 if from a club meeting/outing and members will be advised at the time. It was discussed that a poll to be taken on FB page to look at whether keeping group as open is still suitable and the possibility of making the page closed. Professional photographer speaker. A few possibilities available for this. A video making session, possibly to make an instructional video of a specific area of photography. Carl has access to top quality equipment for this, either before May or after September. Halloween dry ice session with possibility of members dressing up. Steam punks session. Martin Cooper to help look into this. Use of water on glass etc. Editing session possibly on a Tuesday to look at various available programmes. Whitby Goth weekend.12th to 14th April.25th to 27th October. Night in Hull town centre. Possibly 2 sessions (1 light night, comparison dark night). Waters edge. Discussion with Richard P. to arrange? Competitions to be ongoing on the FB page. Website to be updated & hopefully used by more members. Note: We’ve also opened a new page on the website which will provide a guide to our meeting dates throughout the year. See : Key Dates at a Glance. HEDON VIEWFINDERS holds its second exhibition at the Hedon Museum opening Wednesdays and Saturdays between Wednesday 24 April and Saturday 15 June 2019. Members are invited to submit prints of original and new material (but definitely not more than 12 months old) with content that is related to or linked to “Hedon” in some way. You can be as creative and imaginative as you like in interpreting the theme and can submit photos of any genre from Abstract to Wildlife. HEDON VIEWFINDERS holds its second exhibition at the Hedon Museum opening Wednesdays and Saturdays between Wednesday 24 April and Saturday 15 June 2019. Members are invited to submit up to three prints of original and new material (but definitely not more than 12 months old) with content that is related to, or linked to, “Hedon” in some way. You can be as creative and imaginative as you like in interpreting the theme and can submit photos of any genre from Abstract to Wildlife. #UPDATE: Photos taken at the Club meetings since January 2018 are also acceptable as part of a sub-category ‘getting involved in the Club’ section. Prints in the first instance should be up to A4 (210x297mm) in size (portrait or landscape) and the selection of prints for the exhibition (approximately 20) will be decided on Wednesday 3rd April which is the deadline for submission of entries. Prints will be mounted up to 400x300mm for the exhibition. #UPDATE April 9 (a Tuesday) – Practical session to prepare the exhibition prints for display takes place at the Haven Arms 7pm. NEW deadline for submission of entries. Your prints can be brought to the meeting on 3rd April or you can arrange to get them to us before the 3rd. We also invite you to share your digital images with others in the club, to help generate ideas and inspiration, via the Facebook group page album ‘Hedon Exhibition’ or email them to us and we’ll add to the website. For those needing help with any aspect of printing your images, or submitting your image then please get in touch. We are delighted to welcome Nigel Walker to Hedon Viewfinders on Wed 20 March, who will give us his talk on ‘Shooting War’ first given at Beverley Art Gallery last year. We are delighted to welcome Nigel Walker to Hedon Viewfinders, who will give us his talk on ‘Shooting War’ first given at Beverley Art Gallery last year. Nigel looks at the impact photography has had on our understanding of and attitudes to war. From the earliest days photography has been seen as an aid to armies, although photographers are now sometimes viewed as enemies of governments seeking to prosecute wars. This talk will look at four wars, four war photographers and four individual pictures that have been significant in the history of recording war. Nigel warns that some of the images shown will contain scenes of war and death and could be distressing for some. Note: A collection will be taken at this meeting to cover costs. The next meeting of Hedon Viewfinders is a special meeting to review the club and its activities to date and to consider proposals for its future – particularly over the next 12 months. Your attendance is encouraged and would be greatly appreciated. The meeting will start promptly at 7pm on Wednesday 6 March 2019 at the Haven Arms, Havenside, HU12 8HH. It is always a good idea and practice to regularly have a look back at what an organisation has achieved to date, note what has gone well, and note the areas where improvements might be made. Based upon that experience, we can then take decisions and make plans on a better way forward. This meeting will be an opportunity for each of us to have an input into shaping the future development of the club and its photographic endeavours. The AGENDA is draft and you have a chance to put your ideas and specific proposals up for discussion. The Agenda will only become final on Wednesday Evening of 27th February. So look back here for the final version on Thursday. For ease of decision-making, any specific proposals should appear on the Agenda. Ray Duffill normally facilitates the meetings, but at this meeting it would be useful to have another volunteer to do so. A volunteer to take notes of the key decisions (see final item on the Agenda) would also be useful. We’ll ask at the meeting for these volunteers. Review of the Club – Short session to remind ourselves what we’ve enjoyed/not liked as much from the Club. Social Media review – Particularly the operation of the Facebook Group and its competitions. Programme of meetings for 2019; ideas for speakers and practical sessions. Field Trips/photo walks/visits/holidays – Ideas. Any other business not covered by the above. To record formally any decisions made on the night, including any votes taken, and to note the member(s) assigned responsibility to implement decisions. This record will be written up as minutes and posted on the website. Whilst the above might seem much more formal than is normally the case, the issues under discussion do present the club with opportunities to develop and grow in many exciting ways. And rest assured it will be conducted in the typical Viewfinders fun and friendly style. Paul Berriff – An Extraordinary Life Behind the Camera. Destined to be our biggest meeting of the year on Wed 17 April 2019. This is an advanced notification to Viewfinders with an opportunity to book tickets. “Paul Berriff – An Extraordinary Life Behind the Camera”. “Paul Berriff – An Extraordinary Life Behind the Camera”. ‘Hedon Viewfinders – Through the Lens’ photographic club, in collaboration with Hedon Museum, is privileged to have BAFTA-winning documentary maker, photographer and film director Paul Berriff, OBE, speaking at its meeting on Wednesday 17th April 2019. Paul Berriff with the camera he used to photograph The Beatles. Paul Berriff began his career working as a press photographer in 1960’s Leeds, and was doing ‘street photography’ before that phrase was regularly coined. His press pass also gave him access backstage to local live-music venues where he could meet and photograph the performers, many who later went on to achieve pop and rock star status. His immaculate black and white photographs of The Rolling Stones, The Beatles, Jimi Hendrix, Roy Orbison and other legends have now become collectors’ items. The images, having been stored in an attic for 40 years as negatives, have been lovingly redeveloped and have only quite recently been exhibited for the first time in their full glory. Many of these iconic artworks will be on display at an exhibition at the Hedon Museum from April 24 to June 15, which are the same dates as Hedon Viewfinders own exhibition at the Museum. It is, however, as a documentary film maker that Paul Berriff is better known, He has produced over 180 prime-time major network television documentaries. In 1988 he won the BAFTA Award for his coverage of the 1988 Piper Alpha disaster, which featured in his ITV series ‘Rescue’. In 2017 he was awarded the Guild of Television Cameramen Award for Continued Excellence in Cinematography. Paul has also had the most extraordinary life experiences, which in the broadcasting industry has earned him the nickname, the “Indiana Jones of Television”. He has survived a major helicopter crash, leapt to safety from a sinking ship during a North Sea gale, and escaped death in Nicaragua when a volcano erupted around him. Miraculously, he also survived the collapse of New York’s Twin Towers on 9/11, where he was filming at the foot of the South tower at the very moment it collapsed. Having been knocked out and buried under debris, he was the very first casualty stretchered into the make-shift medical facility set up for the victims. Despite his camera having being buried and burned, Paul managed to retrieve it whilst searching for missing colleagues. The dramatic footage retrieved, is some of the most powerful recorded of this horrific event on that terrible day. The meeting will be an opportunity for Paul Berriff to recount some of his remarkable life experiences behind the camera including seeing some of his unique images and videos. Tickets available now. £5 (£4 to our regular attendees at meetings). Get the date in your diaries! You can pay me for your ticket online by PayPal at the link below – then email me at viewfinders-ttl@gmx.co.uk and once payment is confirmed I’ll email you your digital ticket and number. Author Ray DuffillPosted on February 21, 2019 April 5, 2019 Categories Meeting, NewsTags Club, Haven Arms, Hedon, Hedon Viewfinders, Meeting, Paul Berriff, Photographic, Tickets, Viewfinders - Through the LensLeave a comment on Paul Berriff – An Extraordinary Life Behind the Camera. Wed 20 February – Show & Tell and optional Constructive Criticism. Wed 20 March – Talk on War Photography, Nigel Walker. A collection will be taken. Wed 17 April – Paul Berriff OBE an opportunity to hear about the extraordinary life of this award-winning photographer and documentary film-maker. Tickets soon to be available £5. We are always after YOUR IDEAS for subjects, themes and experiments for our meetings. Get in touch! Learning about seascapes (Isle of Wight). As well as our meetings which aim to be a mix of both practical and instructional content, we also aim to provide opportunities to get out and about with our cameras, visit exhibitions, attend events of interest, and to take photographs in the company of other enthusiastic photographers. Our outings might be an hour catching a sunset somewhere, full day trips, or indeed a fully-fledged photo holiday. On Friday 7 June 2019 we are taking part in a 4-day trip to Torquay and the English Riviera as part of a National Holidays breakaway. This is the latest in such trips which have seen us visiting Liverpool (inc The Terracotta Warriors exhibition), Durham, and the Isle of Wight amongst other places. The advantage of these trips is that you can focus as much time as you want on taking photographs of interesting places and people, and concentrate on your composition, technique, etc, in the knowledge that everyone else with you is keen to do the same. The Torquay 4-day Special Breakaway with National Holidays coaches costs £149 includes an excursion to Dartmouth and whilst we can’t guarantee the weather, offers both beautiful seaviews and landscapes to capture. Includes three nights dinner, bed & breakfast. Evening entertainment in the hotel. Interested? Get in touch and we’ll send you further information and the holiday reference number.